I have a few circles of friends that I see regularly, whether at weekly trivia nights, softball games, or some other activity. I met some really awesome people in the last year, and am so glad for that. I deleted both Tinder and OK Cupid from my phone after some successful dates, so we'll see what happens there. I officially started school and have a plan toward progressing in my career. Work seems better, and I have a great team (though, it is going through some transition at the moment). Plus, I'm doing better at that whole work/life (and school) balance thing, though I feel too busy 90% of the time. I spent my actual birthday by taking the day off work and heading to the mountains with my parents. 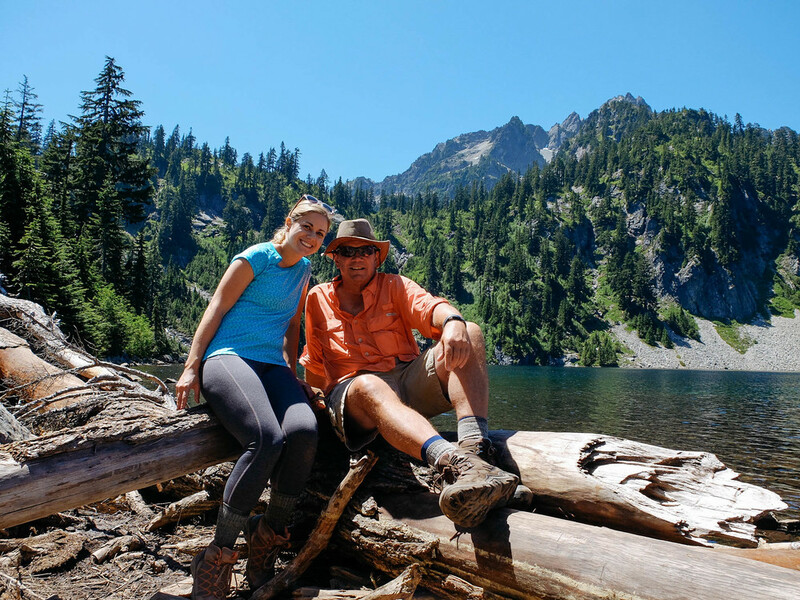 I had brought up the idea of a hike a few weeks before, and my dad remembered that Snow Lake (the one near Alpental) is supposed to be a great hike, and it's not too far away. What better place to turn 30? The day was absolutely gorgeous—much better than it was supposed to be. Perfect hiking weather, for sure. My dad loaded up his pack with all of his backpacking gear to see if he could do it (he could, with a lot of perspiration), and while I could have used this as preparation for the Enchantments, I didn't want to unnecessarily kill myself. It wasn't a hard hike, but the reward was beautiful nonetheless. There's a point where you reach the top of the ridge, and are greeted by a view of the green-blue lake from above, and it was awesome. Reaching that point made the rest of the trek down to the water go so quickly. We made our way down the rest of the trail, pulled out the lunch snacks, and took dozens of pictures before heading back up. Once we got back from the hike, we were short on time to make dinner reservations at Palisade. I drove home, got ready and met them there. Dinner was...slow. And my dad complained, which made things a bit awkward, though well-intentioned. At least the booze and food were good, and coincidentally they sat us at the same table where we spent my 21st birthday, as well. So, turning 30, I figured I might as well do something with friends, as well. At first I had no idea what, but I knew I didn't want to travel too far from home and I liked the idea of karaoke. There aren't many places to do that, so I settled on Waterwheel, one of the divey-est of awesome dive bars. There are also a ton of breweries in the area that I hadn't been to yet, so I also took this as an opportunity to try Reuben's Brews and their new outdoor patio. I'm so glad so many people came! Kickball/softball/trivia friends and Getty-related friends, all in one place! There was plenty of beer, ping pong, corn hole and, of course, karaoke. I was having such a good time that I really didn't take any pictures, but I gathered a few from other people. And now...it's time to do 30!